This dammuso (with swimming pool), it was renovated not upsetting the authenticity of the building, the house enjoys privacy and wide open spaces. In addition to the entrance porch, the dammuso has a covered terrace equipped with table and chairs for lunch or dinner, while taking advantage of the oven and lava stone grill. The Dammuso dei Pini is composed of master dammuso with a large living room, kitchen and living area, a bedroom and two bathrooms with shower. Adjacent to the master dammuso two dependence composed both chamber with two beds and bathroom. The private swimming-pool in an area with sea view offers the opportunity to relax in the complete privacy. The dammuso has: Microwave, TV, stereo, hair dryer, laundry service upon request, barbecue, private parking. 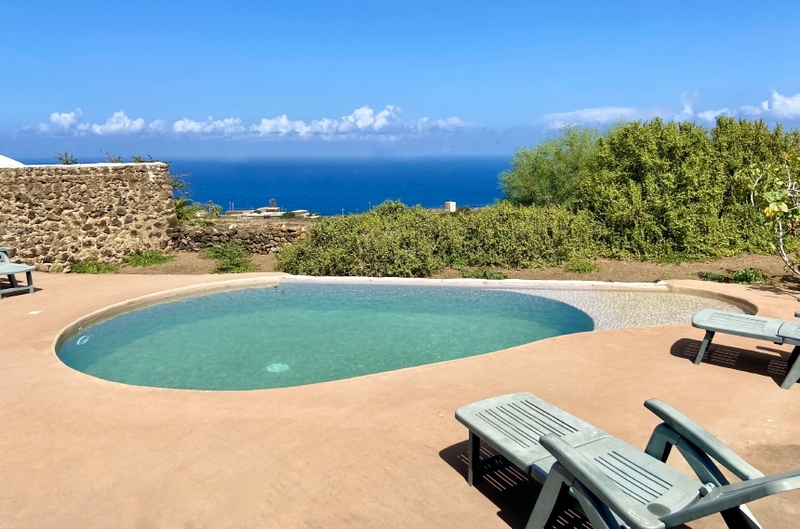 The dammuso is in the Kaddiuggia district, conveniently located as 2 km from Pantelleria center. The Dammuso Le Pigne, can only be booked for 7 days.